Facebook announced that it has been averaging more than 1 billion video views per day since June, with 65 percent of them on mobile, and brands and users that post videos will now be able to see how much of those 1 billion-plus views they were responsible for, as public videos from users and pages will now display view counts. Over the past year, we’ve made several improvements to make it easier for people to discover and share great videos on Facebook. And with an update that will start rolling out this week, people will be able to see how many views a video on Facebook has received. Views will be shown on public videos from people and pages to help people discover new, popular videos. Last year, videos started coming to life with auto-play as people scrolled through their News Feeds. This update rolled out slowly so we could listen to feedback and make tweaks. Today, people in the U.S. and many countries around the world see videos auto-play in their News Feeds. Auto-play settings are easily customizable on both mobile and Web. Video ranking in News Feed was improved in June to show people more videos that are relevant and interesting to them. Another feature that’s currently testing on mobile aims to help people discover new videos: Now, when someone finishes watching a video, we may show additional related videos that they might find interesting. For marketers, digital video, particularly on mobile, is becoming more important, as well. Combining sight, sound and motion, video creates experiences that are, at their best, memorable, moving and inspiring — the types of experiences that help brand marketers drive important metrics, including awareness, consideration and, ultimately, sales. After introducing videos that start playing automatically in News Feed earlier this year, we’ve found that people discover significantly more content with this feature. And when used in combination with our new video views objective, businesses are seeing a significant decrease in cost per view for their Facebook video ads. So in the coming weeks, we’ll extend the availability of videos that play automatically to more content from more brands in the U.S.
People will also begin to see how many views a video on Facebook has received. Views will be shown on all public videos from people and pages. We believe this will help people discover popular videos and help businesses quickly gather information about how their videos are performing. These factors present a clear opportunity for brands, particularly those that advertise on Facebook, where more than 65 percent of our video views are happening on mobile. We’re excited about the progress we’ve made with video, and are committed to building more tools to help marketers of every size take advantage of video’s power on Facebook. We’ll share more about video in the coming months. The Facebook for Business post also included quotes from Jen Daly, senior brand building manager for Unilever’s TRESemmé and Nexxus product lines, and Laundry Service CEO Jason Stein, whose agency counts Nike, Amazon and Michael Kors among its clients. Using videos we uploaded to Facebook during Fashion Week in February, we saw an 85 times lift in view rates versus our previous Fashion Week campaign, which linked to videos from other players. This fall, we will begin tapping into the new video views objective, and our ads are now eligible to automatically play in News Feed. Facebook is and will continue to be a key part of our video marketing strategy going forward. Facebook has become a serious platform for brand building, and video is leading the way. When it comes to video ads for our clients, based on engagement rate, cost per view, view to completion and reach, right now, Facebook is winning by a landslide. 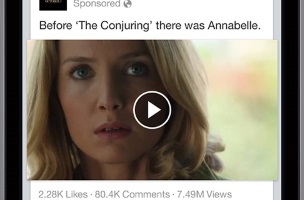 Readers: What do you think of the addition of view counts to videos on Facebook?